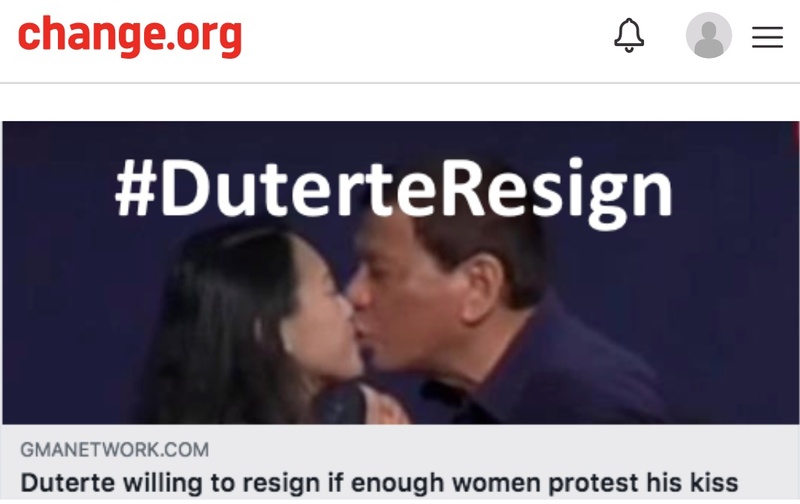 As of this writing, there is yet another Change Dot Org initiative to petition Philippine President Rodrigo Duterte to make good on his promise to "resign if enough women will protest against his kiss on the lips of a married Filipina in South Korea." He said: "If there are enough women to... Well I think if all women here would sign a petition for me to resign, I will resign." If you think the things that President Duterte does and say against women are WRONG and NEVER ACCEPTABLE or should NEVER BE CONSIDERED AS JUST A JOKE or NEVER A PART OF FILIPINO CULTURE, please sign this petition. This just demonstrates once again just how intellectually-bankrupt the Philippine Opposition is in the way it clings on the minutiae of sound bytes released by Duterte every now and then. Latching onto sound bytes is not a political strategy nor is it a proper Opposition platform. It is no more than a publicity stunt aimed at creating mere noise. Filipinos deserve a better Opposition than the sad mob of shrill "feminists" who offer nothing more than circuses like this that they get today.